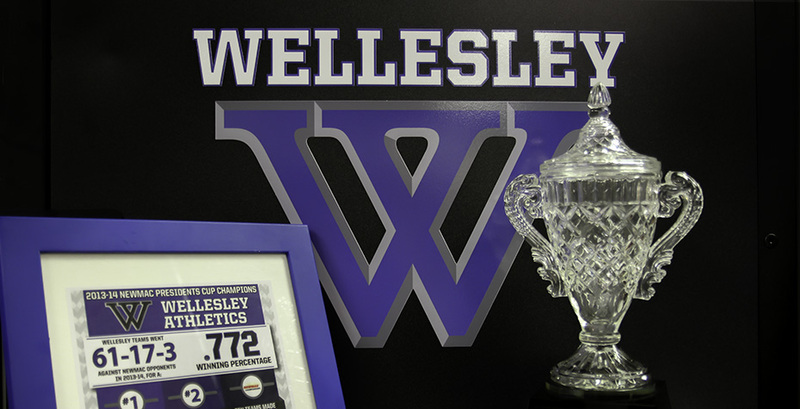 The New England Women’s and Men’s Athletic Conference (NEWMAC) announced last week that Wellesley received the 2013-14 Women’s Presidents Cup. The Blue captured three conference championships on the year and finished second in three other sports. "It is a wonderful honor to win the NEWMAC Presidents Cup," says Wellesley College President H. Kim Bottomly. "This award represents the tremendous drive and dedication of our student-athletes and coaches, who exemplify the mission and spirit of Wellesley's successful athletics program." Since the last athletics update, spring teams continued into the post season. The approximately 18-inch crystal cup is a traveling trophy; it will be on display in the Keohane Sports Center for the year. After that a banner will permanently hang in the sports center to commemorate the achievement. To recap the year being recognized by the Presidents Cup: Wellesley got off to a strong start in the fall, with the field hockey and volleyball teams capturing a share of their respective NEWMAC regular season titles. Coach Julia King’s field hockey team completed the championship sweep, winning the NEWMAC tournament as well, before advancing to the quarterfinals of the NCAA tournament and completing the season with a program-record 18 wins. King, who was named field hockey’s NCAA Regional Coach of the Year, says, "Winning the NEWMAC President's Cup is a testament to the work ethic and dedication of our department and our student-athletes. Wellesley student-athletes juggle rigorous academic schedules with their passion for athletics, and work incredibly hard to succeed in both realms. It is an honor for their athletic achievements to be recognized at the highest level of the conference." Fall tennis and cross country each recorded runner-up finishes at the NEWMAC championship while soccer qualified for the postseason after finishing in a tie for third during the regular season. Wellesley’s success continued into the winter, as the swimming & diving team placed third at the NEWMAC championship. Wellesley basketball also advanced to the tournament quarterfinals after finishing fourth in the regular seasons standings. As noted above, the Blue earned two more NEWMAC titles in the spring, with crew winning the league for the fourth year in a row and softball earning its first conference crown since 2007. Crew’s NEWMAC Coach of the Year, Tessa Spillane, went on to guide her team to a fourth-place finish at the NCAA Division III championship. After winning both the regular season and tournament championships, the softball squad finished as the runner-up at its NCAA regional tournament. "Winning the Presidents Cup is a huge testament to the depth and strength of our Athletics program at Wellesley," notes Spillane. In addition to the coaches' awards mentioned above, numerous members of Wellesley’s PERA community were recognized by the College and by the league and other outside entities for outstanding achievement. Given each year to a graduating senior who has best demonstrated athletic achievement, scholarship and leadership while at Wellesley College. Given to individuals who have rendered outstanding service and support to athletics and recreation at Wellesley. Given to a senior with extraordinary athletic accomplishments at Wellesley. Given to students who have made significant and positive contributions to the athletic program, demonstrated by vital involvement in sports information, event management, or athletic training. Awarded to a traditional first-year varsity student-athlete based on athletic performance. Given to a varsity student-athlete who has inspired others through athletics. Given to the varsity team that best represents the following characteristics: Supports other teams at their competitions; shows genuine interest in other teams’ successes; demonstrates the best of Wellesley Blue’s values through positive sportsmanship; conveys spirit and enthusiasm about their team and sport; actively participates in SAAC.